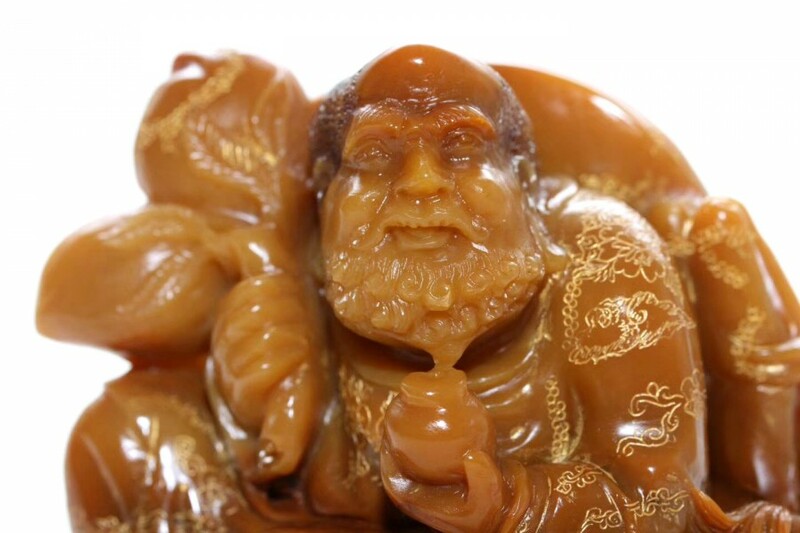 Feature： A Statue of the Arhat(1*), outline in gold, Tianhuang(2*) stone. 1* Theravada Buddhism defines arhat (Sanskrit) or arahant (Pali) as "one who is worthy" or as a "perfected person" having attained nirvana. Other Buddhist traditions have used the term for people far advanced along the path of Enlightenment, but who may not have reached full Buddhahood. The understanding of the concept has changed over the centuries, and varies between different schools of Buddhism and different regions. Mahayana Buddhist teachings urge followers to take up the path of a bodhisattva, and to not fall back to the level of arhats and śrāvakas.The arhats, or at least the senior arhats, came to be widely regarded as "moving beyond the state of personal freedom to join the Bodhisattva enterprise in their own way". They can be seen as the Buddhist equivalents of the Christian saints, apostles or early disciples and leaders of the faith. 2* "Tianhuang" is the name of a kind of stone regarded as the most valuable of all stone sculpture materials in China. 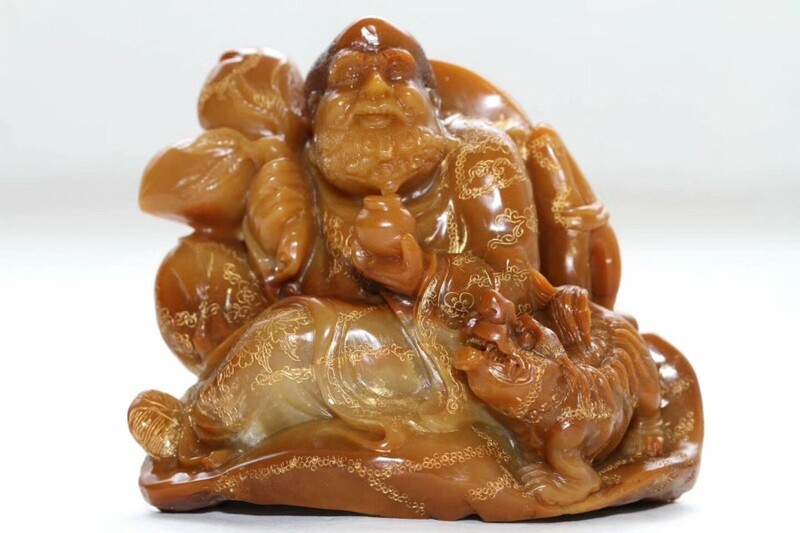 For this reason there are suggestions that tianhuang be designated as the "king of stones" of China. In bygone days one ounce of tianhuang was worth one ounce of gold; today it has become even more precious. 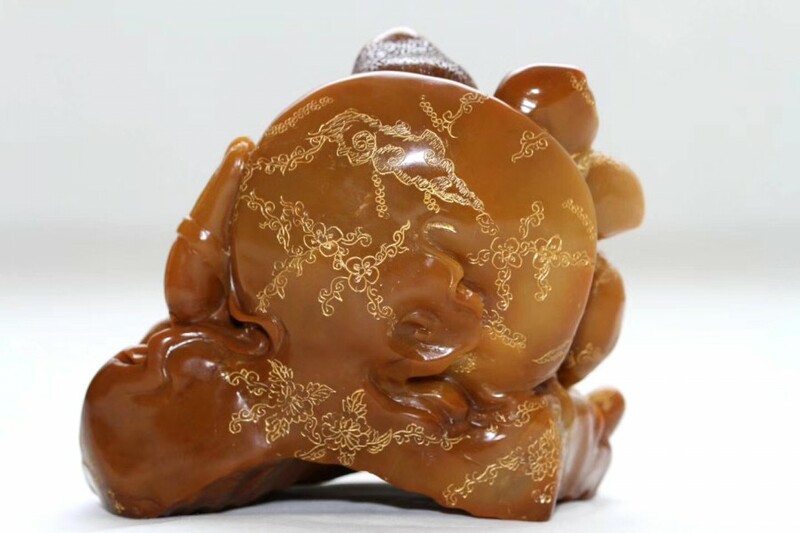 In autumn 1996, the Beijing Hanhai Company put a mid-Qing 460-gram tianhuang seal carved with a dragon-shaped top for auction at an offering price of 300,000 - 50,000 yuan, but the deal was clinched at a whopping 1.4 million yuan, an all-time high worldwide concerning the tianhuan stone. Tianhuang is produced in the mountains by the Shoushan Stream in the northern suburbs of Fuzhou, capital of Fujian Province. 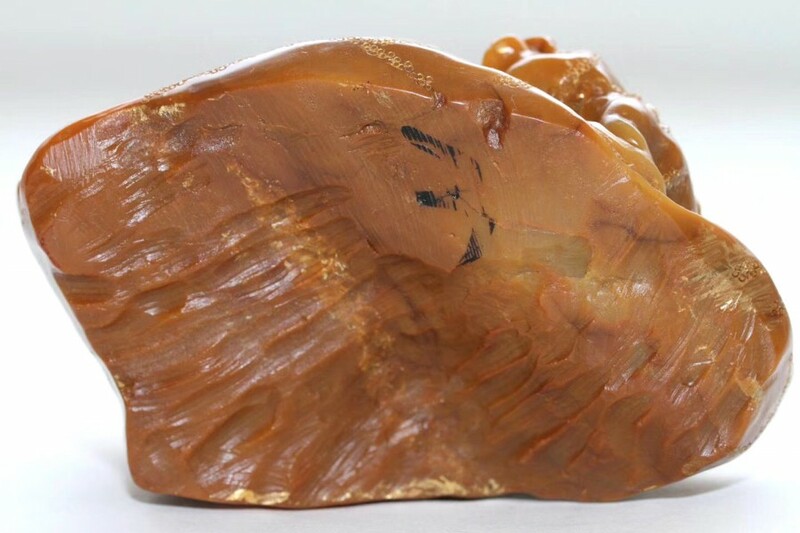 In remote antiquity, cracked stone fell off the mountain and settled in a layer of sand that lay below paddy fields by the Shoushan Stream, and was gradually turned into a kind of sedimental sandy ore that is called tianhuang (which literally means "field and yellow") because of its yellowish colour and because it was mined from underneath paddy fields. Mixed with tianhuang are also stones red, white, black and grey in colour, which are consequently known as hongtian, baitian, heitian and huitian. After many centuries of constant mining, these stones are virtually in non-existence. 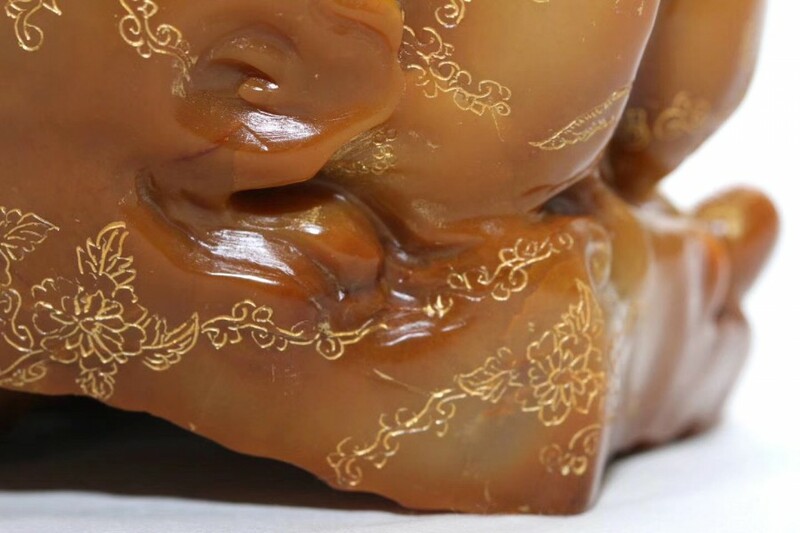 With a crystal and moist texture, tianhuang is regarded as the best material available for the carving of seals, a Chinese obsession.